Dead of the Dead (Dia de los Muertos) is a holiday celebrated in Mexico and in parts of the United States that honors the dead. Traditions include making private ofrendas (altars) to remember and honor the dead and visiting graves with gifts for the departed. A form of it was celebrated in Mexico prior to Spanish colonization and was gradually integrated into the Catholic church’s holidays, All Saints Day (November 1) and All Souls Day (November 2). On October 29 Husband and I attended El Dia de Los Muertos Street Festival in downtown Corpus Christi. Here are photos by Husband, of course. Entering the festival on a beautiful afternoon. Ofrendas (altars) were set up in an old movie theater, the Rialto. This was a public one where people could participate by bringing photos, gifts, chrysanthemums or remembrances of loved ones. This ofrenda was not traditional but it was playfully wicked. Flowers and fruit were left out for Harambe, the gorilla who was shot in a Cincinnati zoo this year to save a child. This beautiful one was for Abraham Lincoln. This more traditional ofrenda honored many deceased family members. For a token donation for the restoration of the Rialto Theater, one could choose a paper flower and write a message in memory a loved one. I left a message for a niece who would have appreciated the art. Not a typical festival couple. What is a festival without a car show? Mural on the tunnel from uptown to downtown Corpus Christi. A native American Indian group performed songs accompanied by drums. At the end the older leader reminded us that we are all brothers of this Earth and that we should care of each other as we take care of our home, Earth. We should all be able to agree with that. PINK PLANE ON THE FLIGHT DECK! Sitting proudly on the flight deck of the USS Lexington is a plane that has gone pink in honor of Breast Cancer Awareness. A press release described it this way. 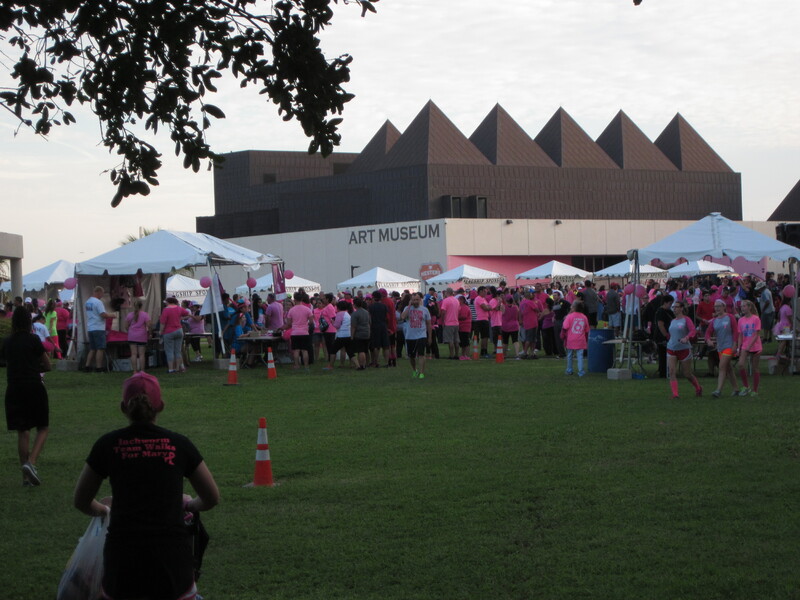 “The USS Lexington is excited to announce the very first F9F-8 Cougar painted in pink. 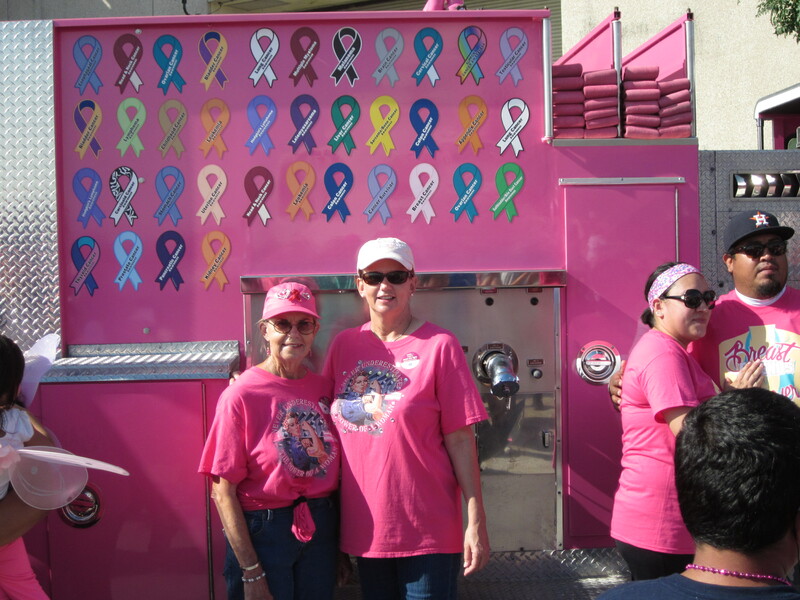 The F9F-8 Cougar will be displayed on the flight deck, for all to see, in support of Breast Cancer Awareness. The jet will remain on display in pink through the month of October and then will be power washed back to its original color. The USS Lexington rests in Corpus Christi Bay, just across the ship channel from downtown Corpus Christi, Texas. “Here we go! We can do this,” I declared confidently. I took the lead as Daughter and I started up the narrow path that would take us over the Port of Corpus Christi Ship Channel on the Harbor Bridge. We had decided it would be fun and challenge our slight feat of heights to join the monthly Bridgewalk. 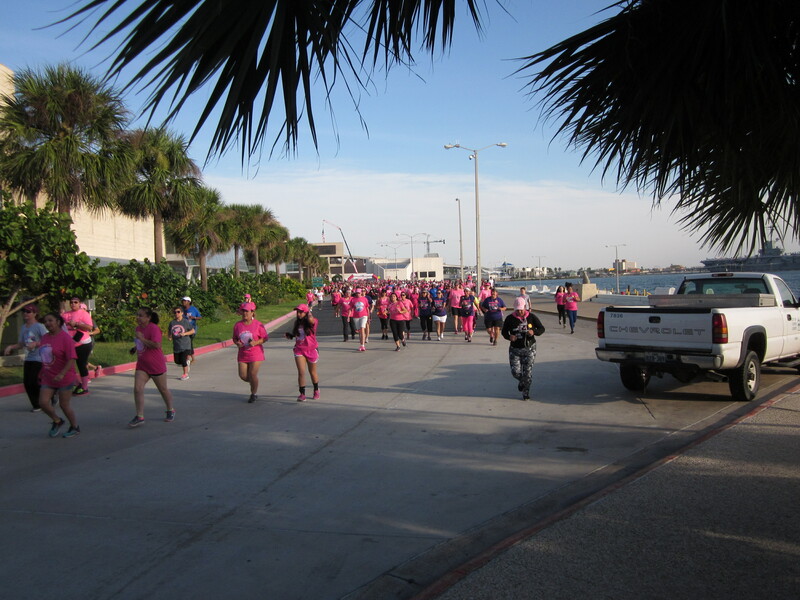 The route starts at Heritage Park in Corpus Christi, goes over the bridge to North Beach and back to Heritage Park. Driving over it was nothing new as we both live in Portland and must drive over it to get to Corpus Christi. 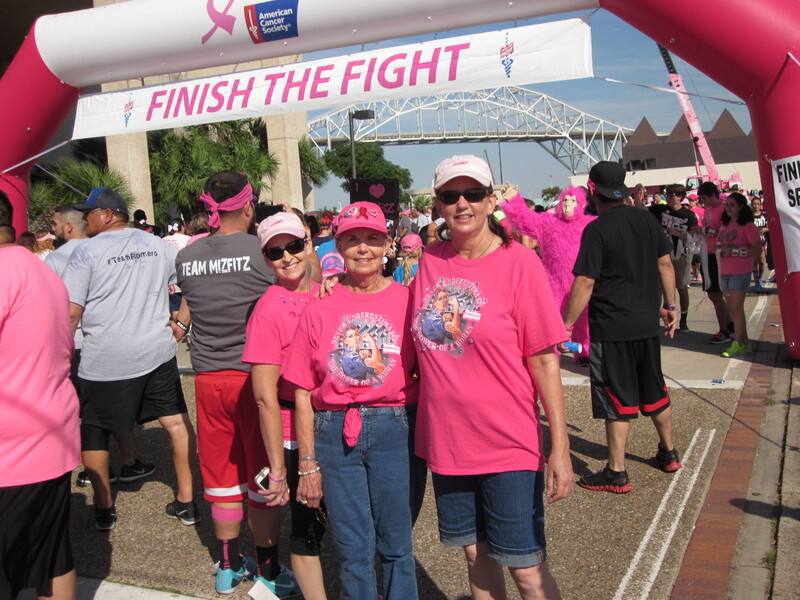 What a fun way to spend Mother’s Day morning – a three-mile walk together! There were walkers ahead of us and walkers behind us. On the left was a concrete barrier and three lanes of traffic. To the right was high open iron railing and below was the ship channel that widened out into the bay and eventually the Gulf of Mexico and far away ports of the world. The sky was slightly overcast but we would have a great view at the top. I had visions of mother/daughter selfies to post triumphantly! As we walked (it seemed like climbing to me) higher and higher and the wind picked up, panic set in like a stone. Could I really do this? I reached for the rough and dirty concrete barrier and my hand hovered over it as I walked as if it would somehow ground me. Don’t look down! Don’t look down! One foot in front of the other. Don’t stumble! Keep your eyes on the person in front of you! The wind was stronger now. Eighteen-wheelers whizzed by from behind as if inches away and seemed to make the bridge rattle. Drivers of pick-up trucks sounded their horns as they passed in recognition of the walkers. I somehow felt like a refugee fleeing the city in fear or part of some death march. Was Daughter still behind me? We were not talking and I was not looking back. The path leveled out as we were beneath the overhead structure of the bridge which made me feel a little more secure, but I was not looking at the view and a selfie was out of the question. No word from Daughter behind me. I trudged on and gratefully started the descent to North Beach. At the bottom Daughter was right behind me as we stopped for a sip of water provided by the organizers. Then under the bridge and back to the other side for the return trip. We could do this! We did it once we could do it again! It was a bit easier going back but I continued to let my left hand hover over the concrete barrier and look straight ahead. On this side of the bridge were Whataburger Field, Hurricane Alley, ships docked for loading and unloading and the refineries in the distance further up the ship channel. “No,” we confessed, “we could not look down!” We could laugh at ourselves now. Husband was there to pick us up. Harbor Bridge will be replaced in five years so we wanted to walk it now. The new one will allow for larger and taller ships. Ground will be broken this soon for the new one. It will be my third bridge. As a child I remember driving with my parents over the drawbridge, Corpus Christi Bascule, on our way to North Beach. I hope to see my third bridge and may want to walk over it and will certainly drive over it. Cheers! Bascule Bridge raised to allow ship to pass. New Harbor Bridge towers above it. The drawbridge was later torn down. From my postcard collection. A conceptual image of the new harbor bridge as seen from Whataburger Field. 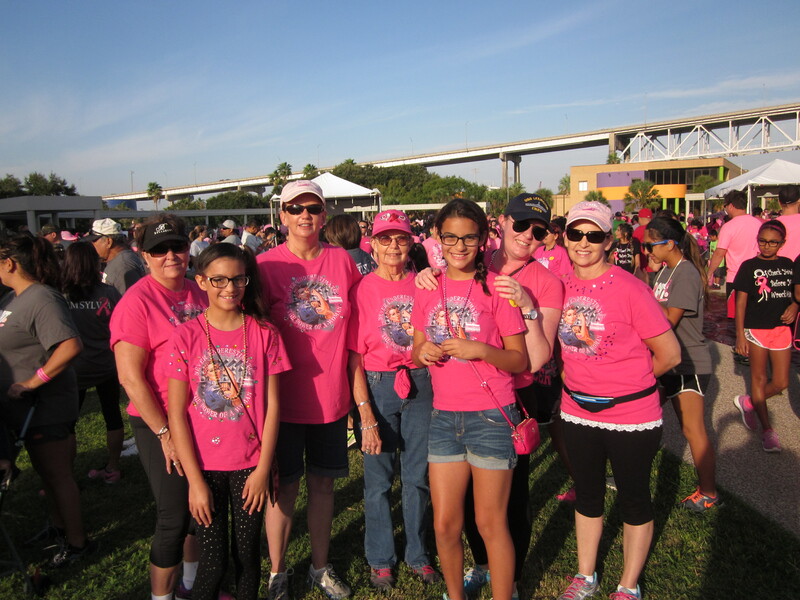 On Saturday, October 17, I participated in a walk to raise money for the American Cancer Society as a member of the BETTY BOMBERS team from the USS Lexington on the Bay Museum where my daughter works. Husband trailed along to take these photos. 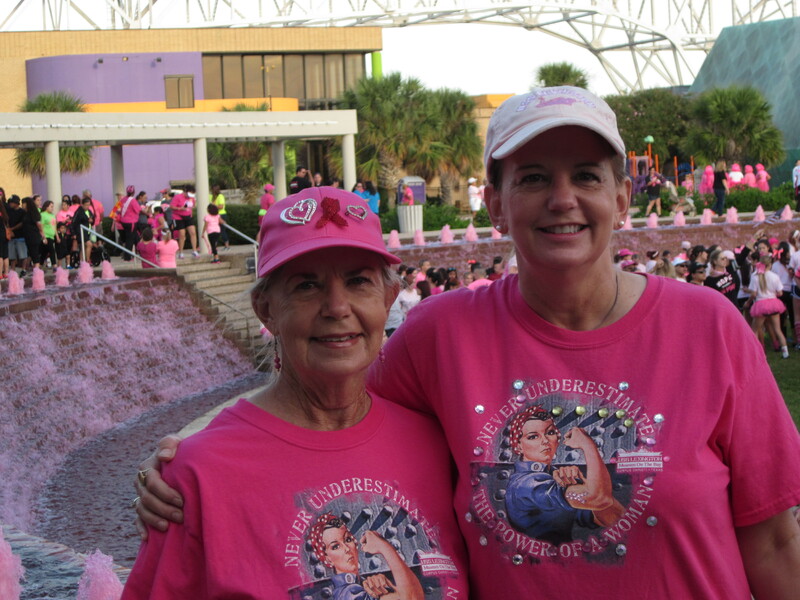 My daughter and I walked in honor and in memory of my niece, CHERYL LYLES SMITH, who died in 2012 of cancer. 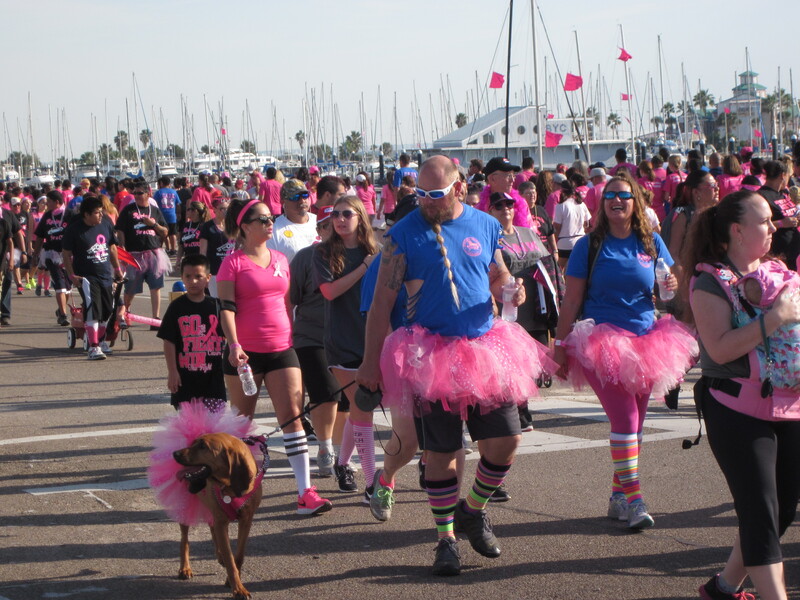 There were 16,000 walkers who raised $460,000; the BETTY BOMBERS raised $5,374. 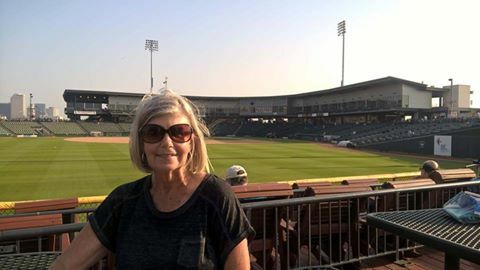 Below are photos that Husband took on a gloriously beautiful South Texas day. 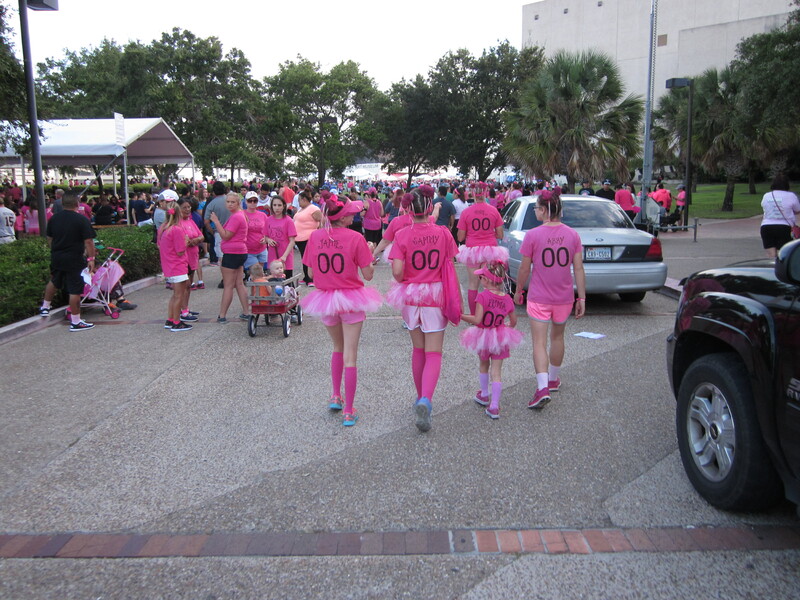 Some of the Betty Bombers getting ready to walk. 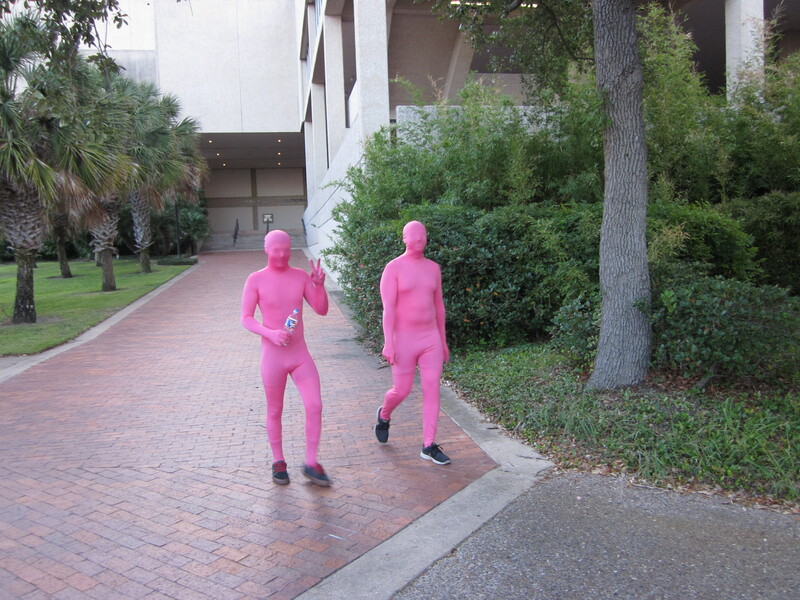 Pink Men from Radiology Associates, a sponsor. Walkers checking out the booths before the start. The Water Garden was turned pink. 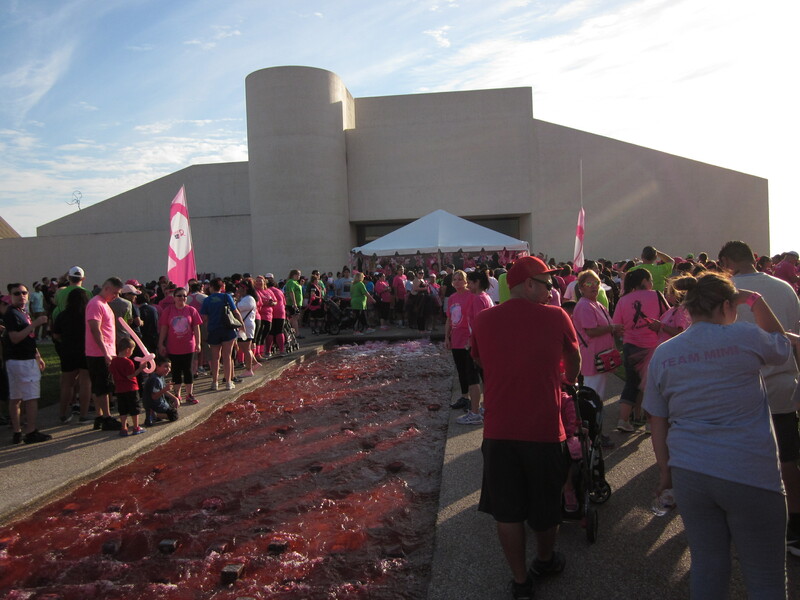 Source of the “pink” fountain with the original part of the Art Museum in the background. 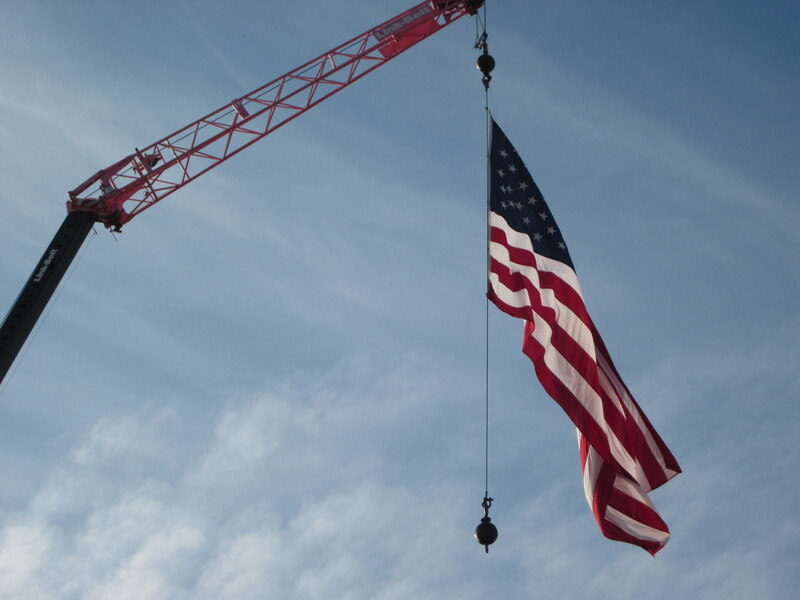 Old Glory raised with a pink crane. 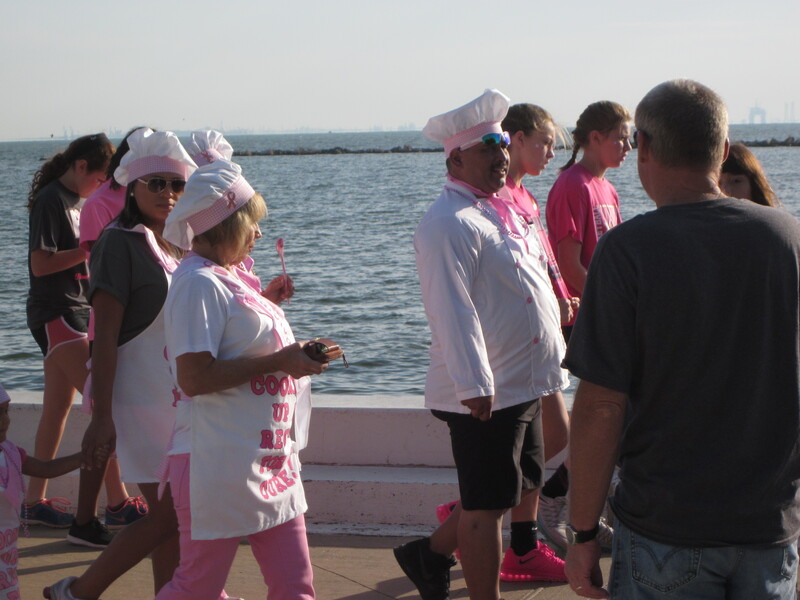 They’re off and walking/running along the bay front! 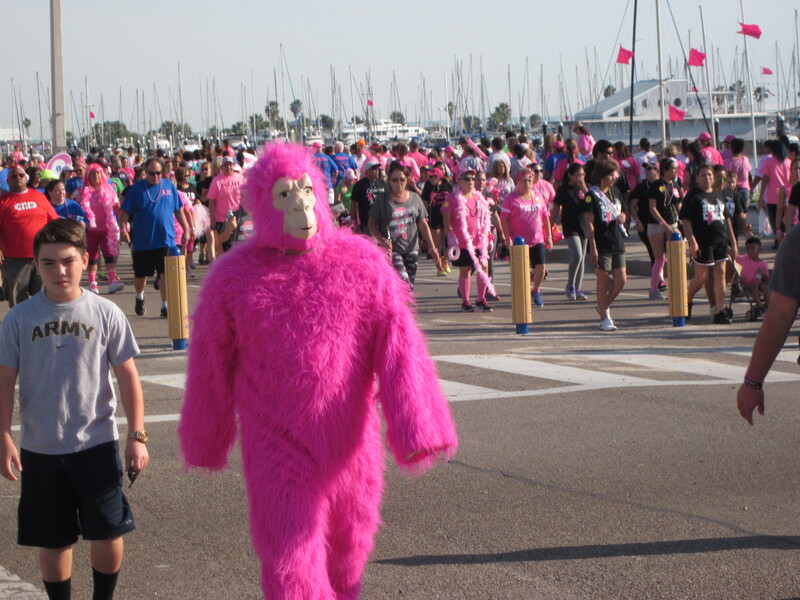 The pink gorilla in the walk. 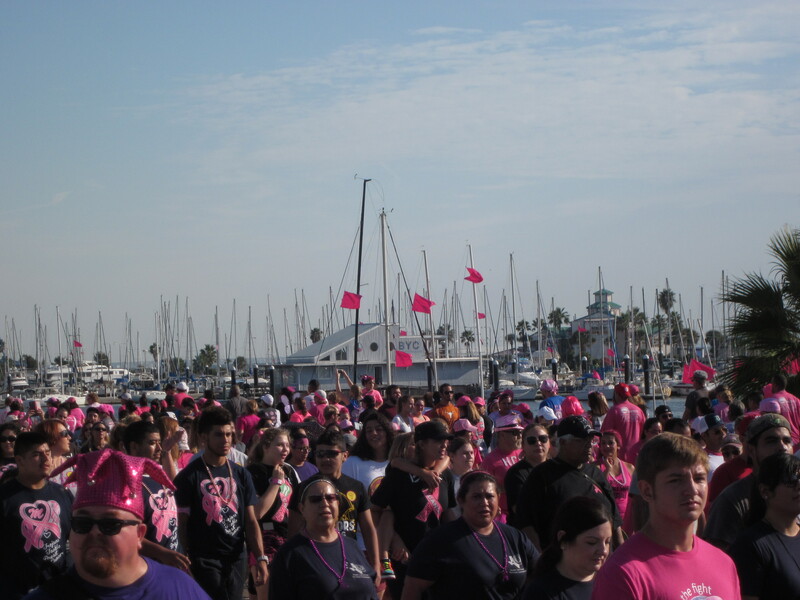 The marina is in the background; many of the boats had pink flags. This blood hound and his parents wore tutus. We made it! So did the pink gorilla! 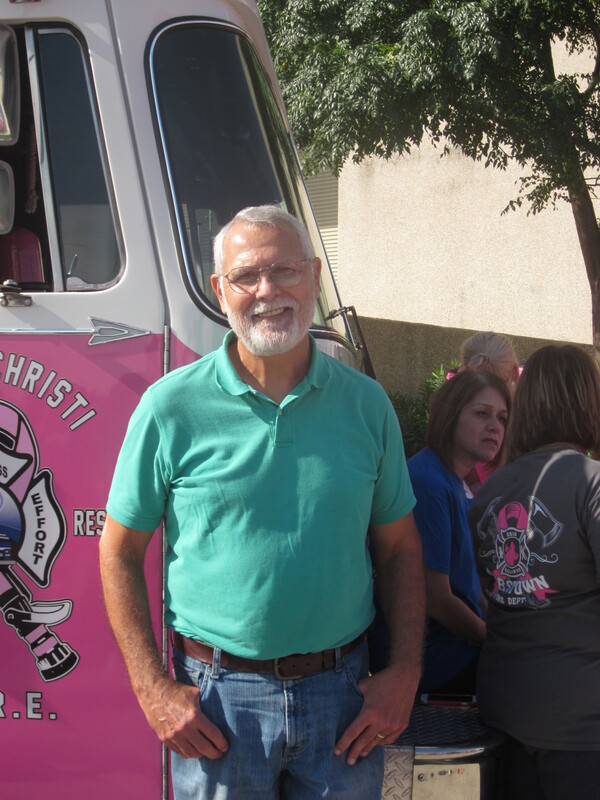 At the pink Corpus Christi fire truck with ribbons for each type of cancer. 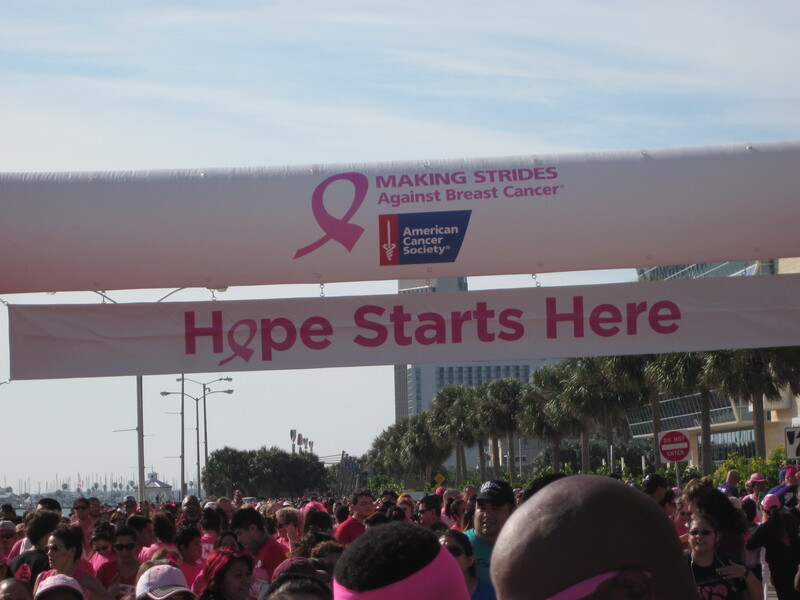 This post is dedicated to those who survived breast cancer and to those who fought and lost and to all whose bodies have been marked with cancer of any type. One of my favorite movies is “The Birdcage” with Robin Williams, Nathan Lane and Gene Hackman, as there are so many layers to savor. 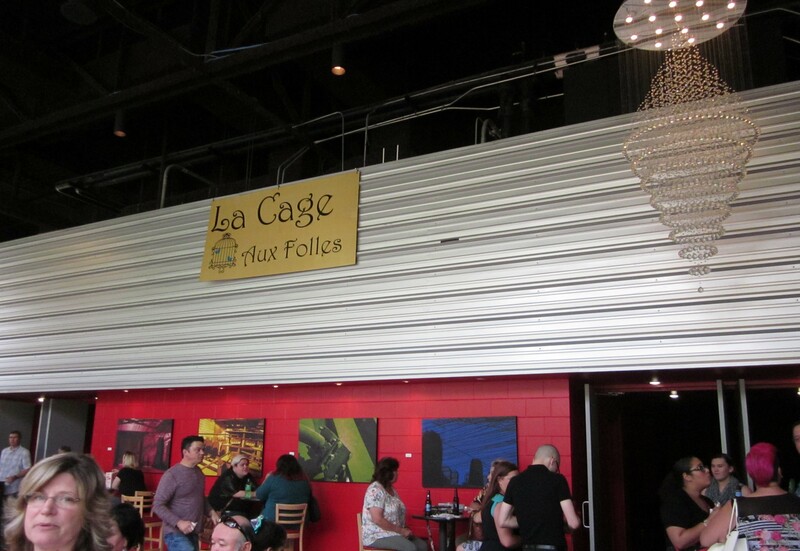 Yet I had never seen the musical, “La Cage Aux Folles,” until I saw it last month at a local theater, Harbor Playhouse, in Corpus Christi. 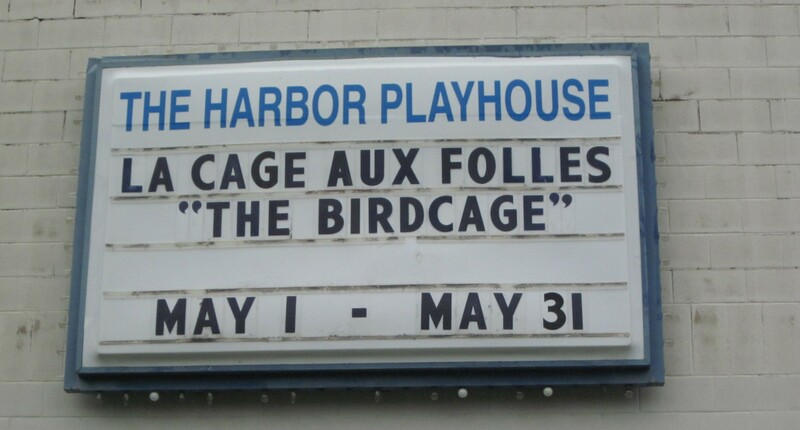 Husband, Daughter and I attended a Sunday matinee performance. 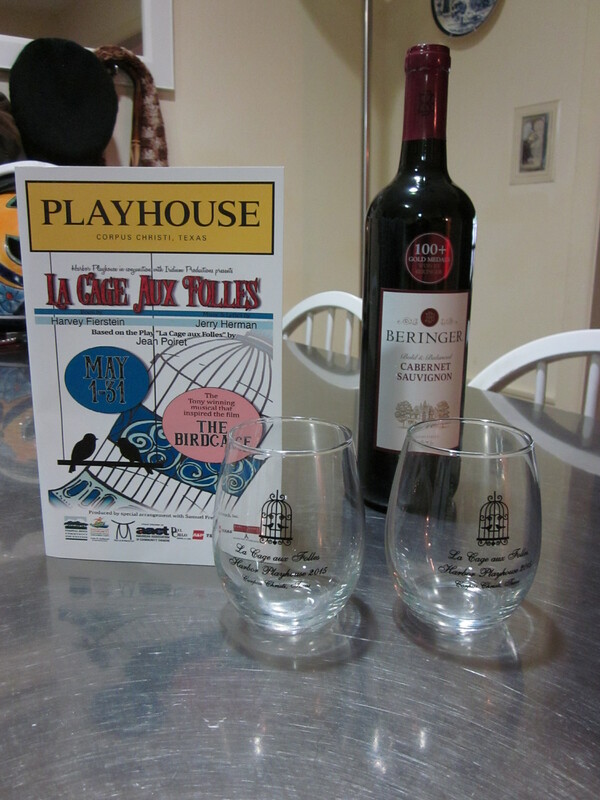 Daughter and I were delighted when Husband brought our wine in commemorative glasses. 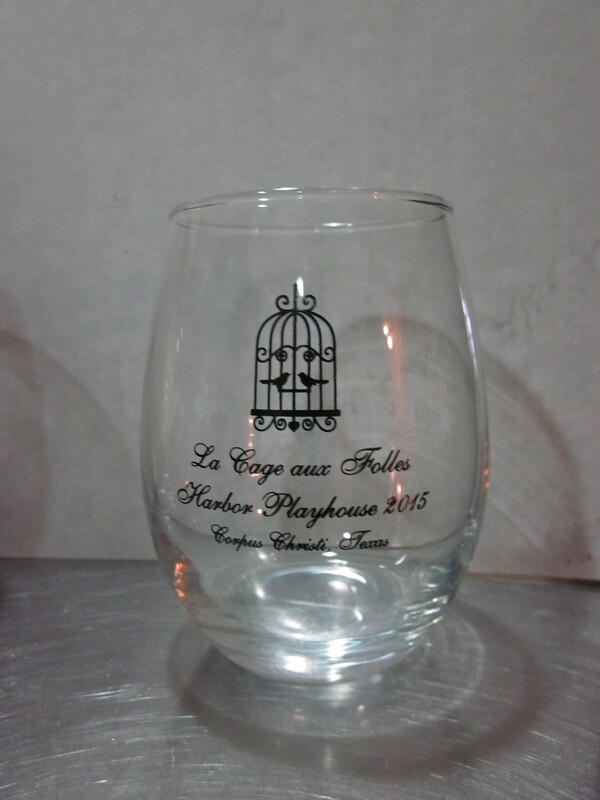 The production was great fun and an outstanding last performance. My favorite song was “The Best of Times is Now”as it reminded me (at this age) that the best times are those right now in the moment…tomorrow…who knows…CHEERS! 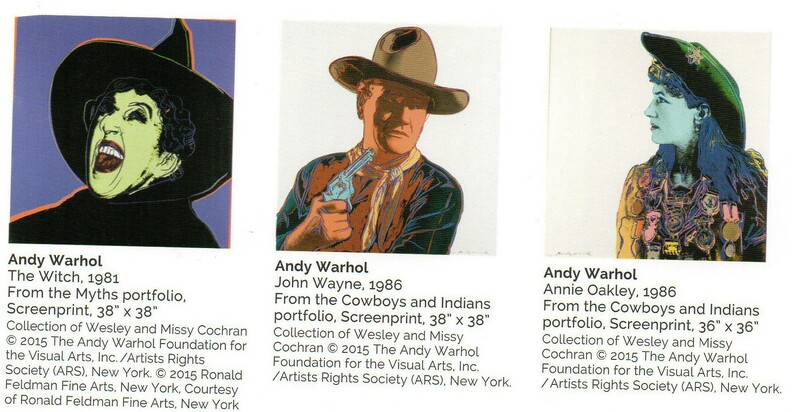 Andy Warhol is back on the bay – at least his art is back. 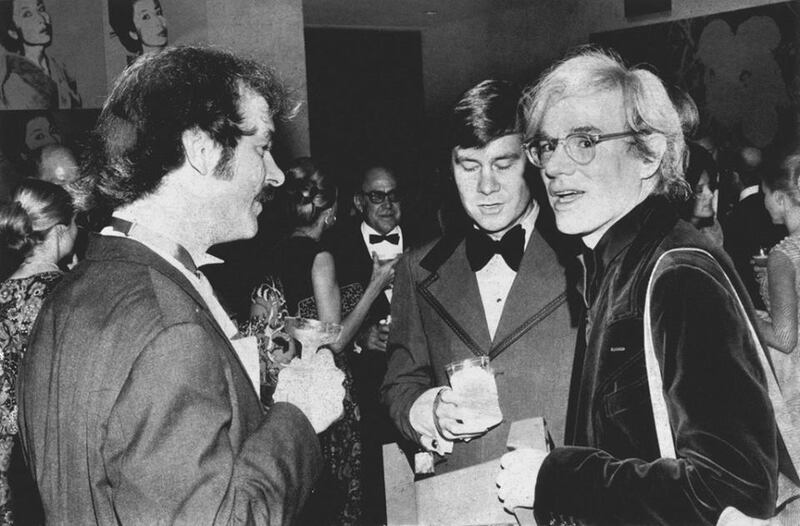 Warhol and his art are were here 43 years ago at the opening of the Art Museum of South Texas. 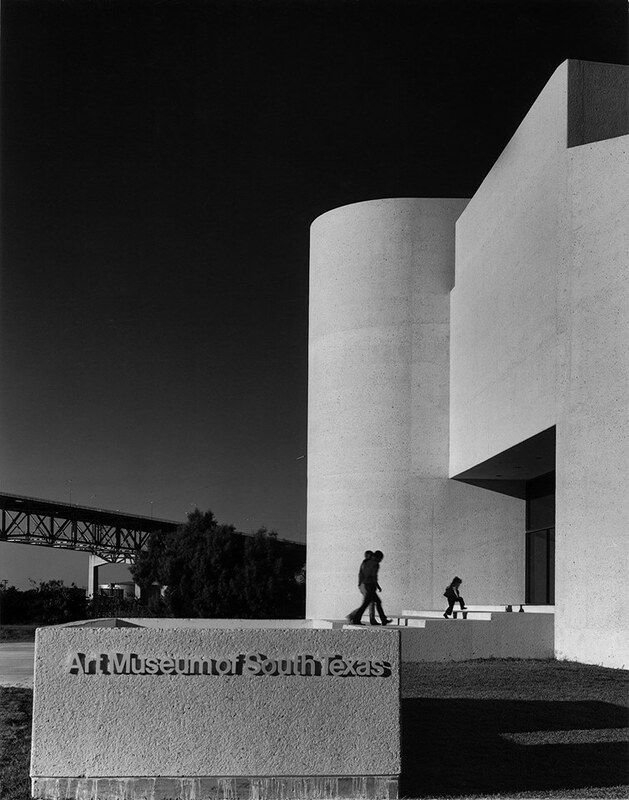 I moved to Corpus Christi that year (1972) but did not see the exhibit. 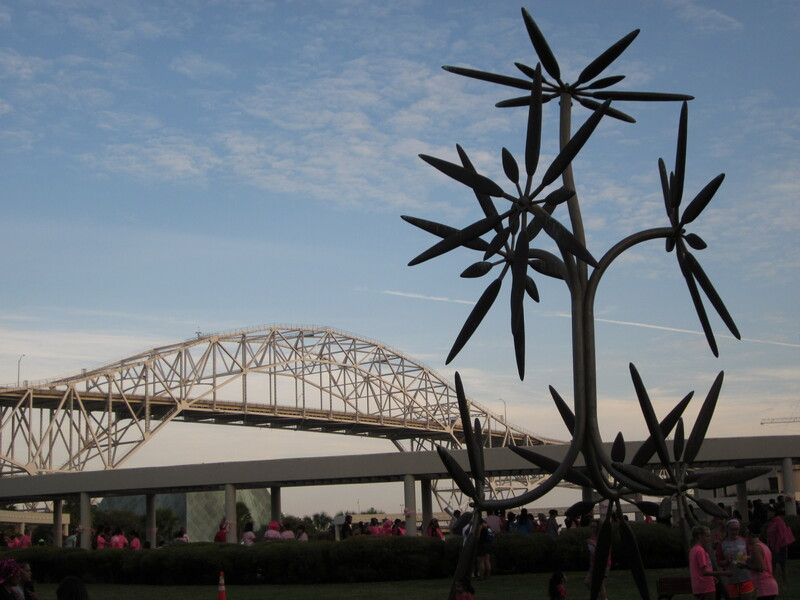 The building was designed by modern architect Philip Johnson and was built at the entrance to the Port of Corpus Christi. At the time it was a stark contrast from the modest neighborhoods that were nearby. 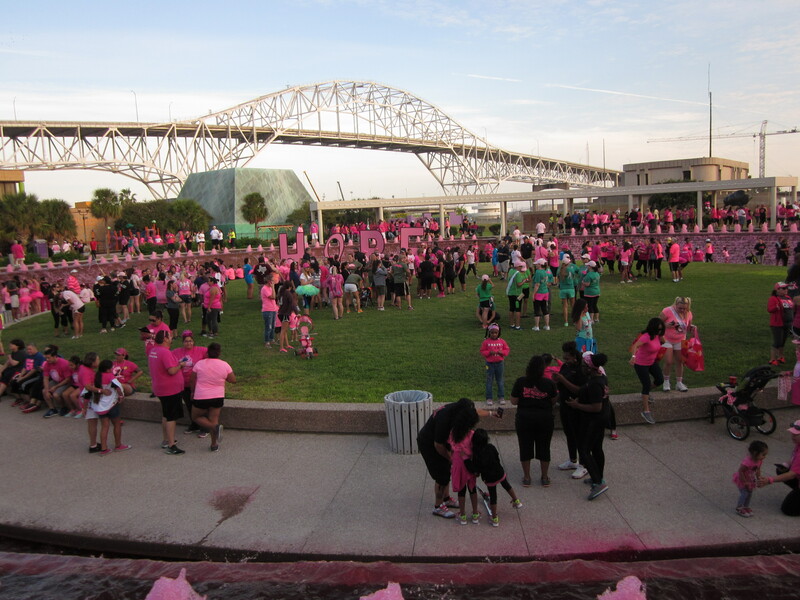 Today we have Corpus Christi Museum of Science and History, Harbor Playhouse, Museum of Asian Culture, Whataburger Field, American Bank Center , Solomon P. Ortiz International Center, and Hurricane Alley all nestled and thriving in the shadow the Harbor Bridge. The museum as it is today. The original on the right is the one Philip Johnson designed. In 2006 the space was doubled with an addition designed by Mexican architects Ricardo Legorreta and his son Victor Legorreta and features 13 distinctive pyramids. Ricardo Legorreta died in 2011 at age 80. The poured white concrete and shell aggregate walls of the museum were the perfect background for these iconic pops of color images of John F. Kennedy, John Wayne, Mickey Mouse, Santa Clause, Sitting Bull, Warhol himself and others. My favorites were those sprinkled partially with diamond dust. 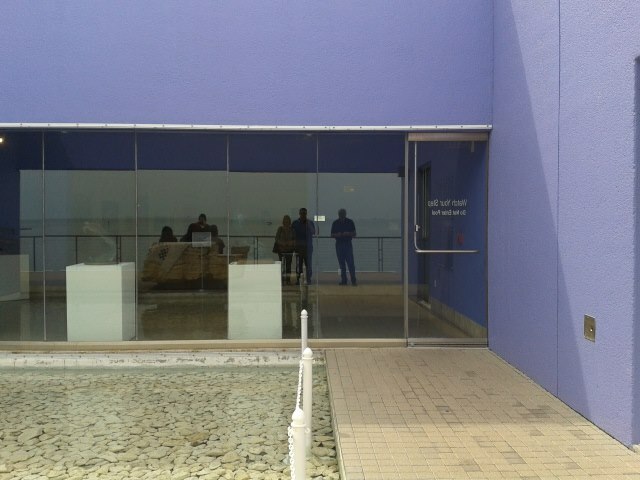 Reflected selfie of Crone, Husband and Son outside the museum.